Specify standard green solder mask and a standard RoHS surface finish such as HASL for low complexity PCBs. 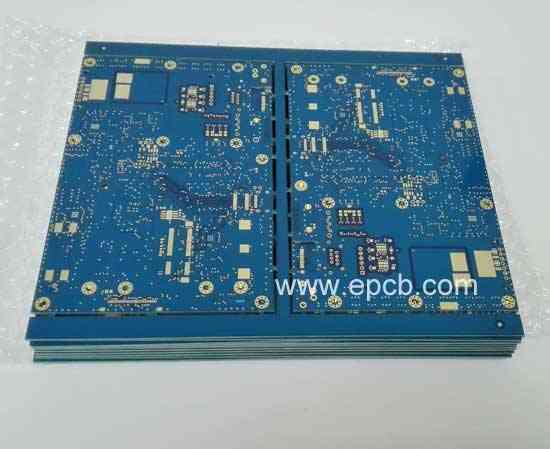 For medium to high complexity boards, HASL is not preferred since it does not provide a flat surface. In this case, immersion gold is the preferred finish. Provide complete PCB design files to your manufacturer, including Gerber files and dimensional drill drawings. Use the silkscreen layer to reference component locations, orientations, and polarities. V-scoring, as opposed to routing, is recommended as the best, most cost-effective way to break out boards from a multi-up array. Routing will usually leave excess material on the edge of a board after separation. Where possible, allow X-outs (defective boards on a panel) as this will ensure higher yields for the manufacturer and lower product cost for the customer. When designing PCBs to endure a high thermal load, note that the glass transition temperature (Tg) isn't a measure of the maximum operating temperature—rather, the board will be able to operate at this temperature only for a short period of time. Whenever possible the PCB should have components on one side, if it is necessary to have components on both sides, limit the through-hole parts to only the top side.